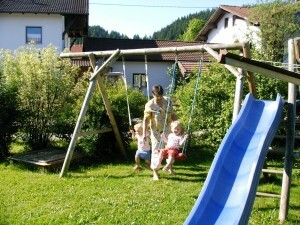 Enjoy with us Allgäu hospitality and natural holidays. The typical countryside idyll can also help you to get a quick holiday atmosphere. All 3 apartments are 60 m2, can accommodate 2 to 4 people and are on the first floor. They were qualified in 2014 with 4 stars. Equipped with kitchen, living rooms, bedrooms and bathrooms (bath, shower and toilet), and access to large balconies provide the conditions for a relaxing holiday.. The price includes towels, bath towels and bed - linen as well as the costs for water, electricity, waste charges and heating.. If desired, you also get breakfast..